Financial life is like puzzle and you need good financial planning to solve this puzzle. Unfortunately due to lack of knowledge we take financial planning so lightly and end up in awkward situations. We wish we could purchase luxurious home, live lavish lifestyle and retire with security, however we forget that no wish becomes reality without planning. 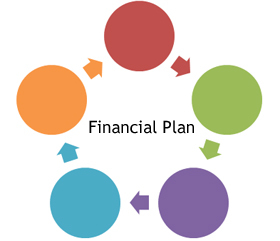 In order to help you I am here with financial planning steps that work for everyone. Financial plan given here is very simple and will take less than an hour to start. Follow steps given below to make your financial plan. Take pencil & paper or open spreadsheet and make two column assets & liabilities. Note down what you have in asset column like cash, funds in bank accounts, value of stocks, bonds, mutual funds, PF balance, current market value of property etc. Once you are done with listing assets write-down about your liabilities. Liabilities are debts or payments you owe to someone else. This includes home loan, education loan, personal loan etc. Subtract your total asset value from liability to know your personal net worth. This step is necessary to decide what you have in your hand for your future. Now take a moment to think about your future need which demands money. Write down by when you will need how much money for what purpose. This is called as setting up goals. Make sure to consider inflation while formulating these goals. Once you have a list of goals, start assigning priority to your goals. You may classify this goal as short-term, mid – term and long-term goals. Your task does not end here these goals are not like “Fire and forget missile which will attack on target and destroy it once fired”. You have to be smarter and need to occasionally re-evaluate where you are with your goals, considering possible life-changes and new desires. Find out various investment options which suits your risk profile & goal. If you have mindset to protect your capital and get return on capital you can opt for “Debt” as investment option, and if you are ready to take risk you can opt for “Equity” based investment. You should track investment made by you on regular basis. If investment made by you is not working take appropriate action towards fulfillment of your goal with alternative investments. Insurance is necessity today; Life is full of uncertainty and if you are the only earning member in your family you should take life insurance. Remember insurance is for “risk coverage” and not for “investments”. You should buy good 40 year term insurance plan at the age of 25. Make sure total sum assured is 30 times of your monthly income. You should keep 6 month of your income as Emergency fund. Creating Emergency fund is planning for unplanned event. This emergency fund will help you to fight with financial emergencies like job loss, unwanted medical expenses or something you have never dreamed of. Follow these steps and I am sure you will get financial success. In order to help you I am herewith simple excel sheet which will surely help you to make your financial plan. Download Simple Finance Plan from here. Invest 30% of your monthly income in equity mutual funds and stocks. Invest in stock market via SIP route. Maximize your EPF contribution. Consider ELSS for saving tax. Buy Health insurance for every member of your family. Take home loan only if it is necessary. Home loan period should not be more than 15 years. You should close home loan in 7 year. All the best and Happy Financial Planning! The main thing to look out while sketching Financial plan is inflation rate. Financial plan is half based on the projections you make. You cannot take same inflation rate for all types of future needs such as inflation rate in education and medical is far more high than lnflation in day to day needs. So one must be careful while draftinf financial plan. Yes, I am in agreement with you.That’s why in second step of financial planning details about inflation is mentioned.